Please do Right-click the driver file, choose the "unzip to ..." to unzip it firstly. Then double-click "setup" to install the driver. If you go to click "setup" directly, it will comes up with an error message saying " Sorry ! We do not support this operation system !!" Actually. it does support your system. This is a dual band WiFi dongle,there are something you should know before you make a complaint about speed. 3. If your computer is desktop, speed is not ideal, you can try to insert the WiFi adapter into the USB3.0(blue) port of you PC, that may guarantee the power supply. 4. This WiFi adapter will not boost the speed of original router, it just transmit the wifi signal. 5. If your WiFi adapter is closed to the router, and you want to have fast speed in watching video and playing online games, we suggest that you should connect to the 5G band. 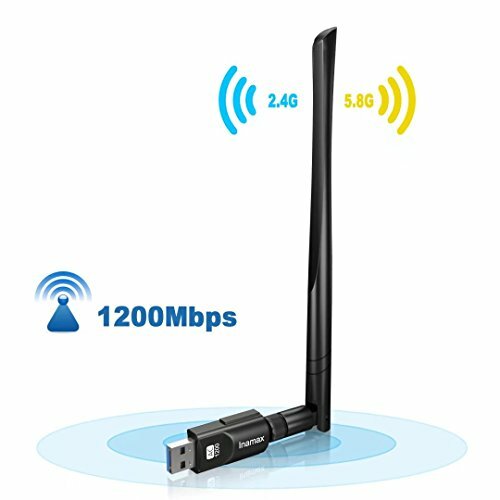 If your WiFi adapter is far away from the router, and you just want to surf the website, you'd better connect to 2.4G band for better and stable signal.